He goes on to describe some best practices for choosing travel-friendly clothing. While reading this… I was instantly reminded of a trip that Jeremy and I made in November. 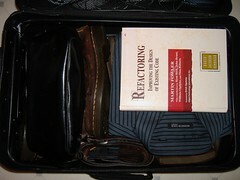 This is how Jeremy Voorhis packs for a business trip.